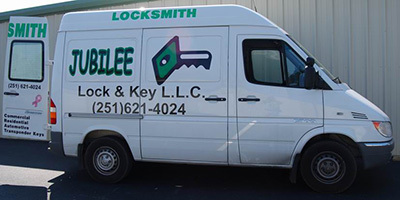 Jubilee Lock and Key offers complete locksmith lock and key services in all of Baldwin County Alabama including Daphne, Fairhope, Foley, Spanish Fort, Robertsdale, Orange Beach, and Gulf Shores. We offer a mobile lockout service throughout all of Baldwin County for both residential and commercial clients. All of our associates are drug tested and go through an FBI background check for your safety. We offer competitive pricing and are dedicated to providing fast, professional service to all of our clients. We provide EMERGENCY SERVICE for your convenience. 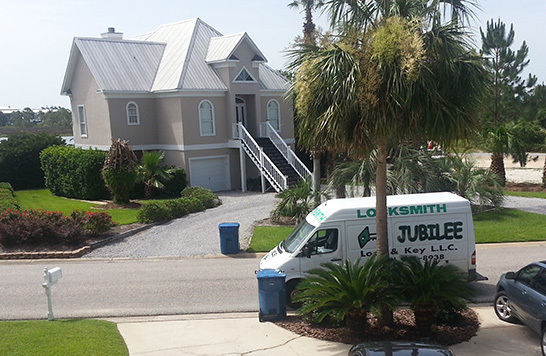 Jubilee Lock and Key offers fast, professional lockout services in Daphne, AL and surrounding areas. We offer automotive unlock as well as keymake for vehicles including transponder, high security and push button start systems. We also provide remote/key fob options as well. We provide lockout services for commercial, residential and automotive doors. We are able to unlock luxury vehicles including but not limited to, Mercedes, BMW and Jaguar. Our lockout service area includes all of Baldwin County, Alabama. Services include rekeying homes, installation of knobs, deadbolts and other security hardware. We also offer quotes for your needs. Yes! We can also make keys for and rekey small aircraft and farm equipment. Keymakes for most cycles including – Harley, Kawasaki, Honda, Suzuki and some scooter brands.